LTC : Journey to Headquarters on LTC in respect of dependent family members of the Government servant - DoPT Clarification; No. 31011/5/2015-Estt.A-IV, Government of India, Ministry of Personnel, Public Grievances & Pensions, Department of Personnel & Training, Establishment A-IV Desk, North Block New Delhi. 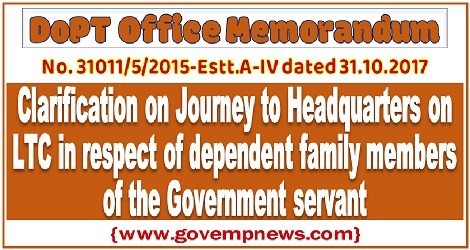 Dated October 31, 2017, OFFICE MEMORANDUM, Subject: Journey to Headquarters on LTC in respect of dependent family members of the Government servant – Clarification reg. It is clarified that full reimbursement as per the entitlement of the Government servant shall be allowed for journey(s) performed on LTC by the family members from any place in India to Headquarters/place of posting of the Government servant and back. When such journey is performed from the Home Town, the LTC shall be counted against ‘Home Town’ LTC and in case the journey is from any other place in India, then it shall be counted against ‘Any place in India’ LTC. The undersigned is directed to refer to this Department’s O.M. No. 31011/14/86-Estt. (A-1V) dated 08.05.1987, which inter-alia provides that the Govt. servant and the members of the family may claim LTC independently, however, reimbursement in such cases will be restricted to the actual distance travelled by the family or the distance between the headquarters/place of posting of the Government servant and the place visited/hometown, whichever is less. 2.Restriction of reimbursement to the distance from the Headquarter/place of posting creates an anomalous situation where the Government servant seeks to avail of LTC in respect of members of the family to the Headquarters/place of posting either from the Home town of the Government servant or from anywhere else. For illustration, a dependent child of a Govt. servant (posted in Delhi) staying and pursuing studies in Mumbai may visit a Government servant at his Headquarters/place of posting (i.e. Delhi) on LTC, however, reimbursement in such case shall be admissible for distance between the Headquarters and place of visit (which in this case is Headquarters itself), which shall be NIL in this case. 3.To resolve the issue, the matter has been considered by this Department in consultation with Joint Consultative Machinery – Staff side and Department of Expenditure. It is clarified that full reimbursement as per the entitlement of the Government servant shall be allowed for journey(s) performed on LTC by the family members from any place in India to Headquarters/place of posting of the Government servant and back. When such journey is performed from the Home Town, the LTC shall be counted against ‘Home Town’ LTC and in case the journey is from any other place in India, then it shall be counted against ‘Any place in India’ LTC. 4.The provisions of this OM (para 3) will have prospective effect.